The influential Nairobi Senator Mike Mbuvi Sonko yesterday accompanied the GoTV Shield Winners, Sofapaka Football Club to State House for a meeting with President-H.E Uhuru M. Kenyatta. In his address, Sonko that the president for his commitment to support the country's talents. 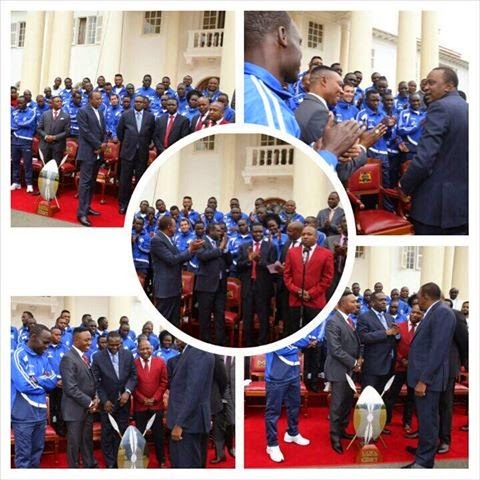 Last month, Uhuru also hosted the 2014 Premier league winners Gor Mahia at State House and rewarded them handsomely. “I feel very proud to join soccer fans across the country in saluting the glorious achievement of the club in winning the GoTV trophy which now gives you a ticket to represent the country in CAF Confederations Cup”. Said Sonko. On Soccer development and leadership, Sonko had this to say “I urge the leadership of the Football Kenya Federation to strive to ensure that soccer players who have shown such vast potentials are properly nurtured, trained and developed to represent the nation at higher levels in future international football competitions. I therefore urge you to remain focused and work harder for future glory. I challenge our leaders, politicians, professionals and the corporate organizations to come out and support our local clubs”. Yesterday, Uhuru asked local football administrators to rise above wasteful squabbles and assist young talent to exploit their potential. He urged soccer administrators to work on modalities that will ensure the national football team and clubs shine in both national and continental championships. The President congratulated Sofapaka for winning the GOtv Shield Cup and assured them of his continued support as the team prepares to represent the country in the secondary continental competition. Sofapaka will carry the Kenyan football flag to the CAF Confederation Cup next year.